New findings by a group of University of Wisconsin-Madison researchers shine a light on how our bodies try to root out latent herpes infections as well as what the virus does to avoid this. Specifically, the research focused on the human cytomegalovirus (HCMV) strain of herpes, which around 67% of the industrialized world is infected with. 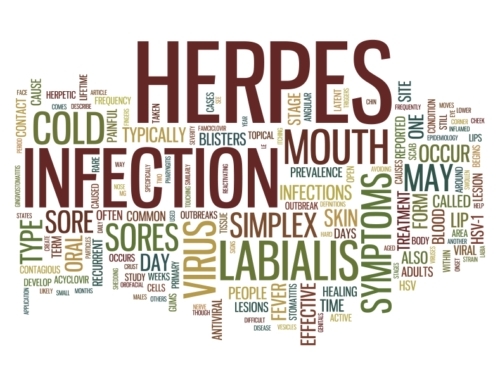 In addition to the cold sores herpes is commonly associated with, the virus family can be responsible for a host of other conditions such as chickenpox or mononucleosis. The HCMV strain in particular is known to infect newborns and cause deafness and intellectual disabilities. Understanding how latent reservoirs of HCMV can establish themselves within the body is a key part of stopping the virus before patients become vulnerable. During an active herpes infection, the immune system is normally quite effective at dispatching the virus. However, HCMV has the ability to infiltrate cells and become passive by co-opting a cellular protein called Daxx. The virus uses Daxx to shut down its own replication function and hide, forming latent reservoirs the body doesn’t detect. HCMV then waits in this state until opportunistic conditions arise, at which point it begins to multiply. What the researchers found is that this process is actually part of an arms race of sorts between the herpes virus and the immune system. While HCMV has this mechanism to become latent and hidden, the body responds with a protein called “lysine demethylases” that attempts to actually trigger the virus into an active infection. This goes against how we normally think of combating viruses, except that being activated is the worst thing that can happen to HCMV in an otherwise healthy person. The body needs the herpes virus to become active so it will attract the full force of the immune system. At the same time as this finding, the researchers also discovered yet another countermeasure that HCMV employs: a protein dubbed “UL138” that blocks the lysine demethylases. How this last step in the chain of attacks and counterattacks works is currently a mystery. HCMV hides inside a cell’s nucleus, which is where the cellular proteins are located. However, UL138 is found outside the nucleus in another part of the cell yet still manages to prevent the cellular proteins from affecting the herpes virus. The current findings demonstrate the abilities of what is called the “intrinsic immune system”; the ability of the body to defend itself from pathogens without an active immune response. Latent viruses are difficult to develop treatments for, but if the body can devise defenses against them then scientists should be able to as well. Further investigation into this behavior is going to be required before more concrete outcomes can be estimated. “How Cells Are Foiled by a Herpesvirus Family Member in the Virus-host Arms Race,” EurekAlert! web site, December 4, 2015; http://www.eurekalert.org/pub_releases/2015-12/uow-hca120415.php. Lee, S. H., et al., “Cellular Defense against Latent Colonization Foiled by Human Cytomegalovirus UL138 Protein,” Science Advances 1, 2015; doi:10.1126/sciadv.1501164.